The kitchen is the heart of the home, so if yours doesn’t make you happy every time you step inside it, then it may be time for a change. However, you may be hesitant to undergo a full kitchen renovation, knowing it’s a costly and time-consuming process. 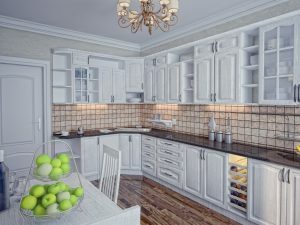 This is exactly why our team at Majors Home Improvement is proud to offer cabinet makeover services that can change the entire look of your kitchen without breaking the bank. We serve homeowners in the Pensacola, Florida, area, and we’re eager to help you love your kitchen once again. Additionally, we can add organizational features to your kitchen cabinets, such as roll-out shelving, concealed garbage, spice racks, and Lazy Susans, among others, to make your kitchen as perfect as possible. Throughout the entire cabinet makeover, you can expect Red Carpet Service from our team. This means that we will be in constant communication with you so that you always know what stage your project is in. It also means that our craftsmen will be respectful of your home when working and even take care to lower your pets’ stress. Once we’re finished with installation and everything has been carefully looked over, we’ll make sure your home is cleaner than it was when we arrived. We believe our customers deserve nothing less than that. If you want to get your cabinet makeover started, contact Majors Home Improvement today. One of our friendly representatives will be happy to schedule a complimentary consultation at your home in the Pensacola area.